IMPORTANT UPDATE: The Women's Happy Hour has been rescheduled to Wednesday, March 13, 2019. We realized that our original date (March 6) is Ash Wednesday. We hope this new date can accommodate everyone's schedule better. 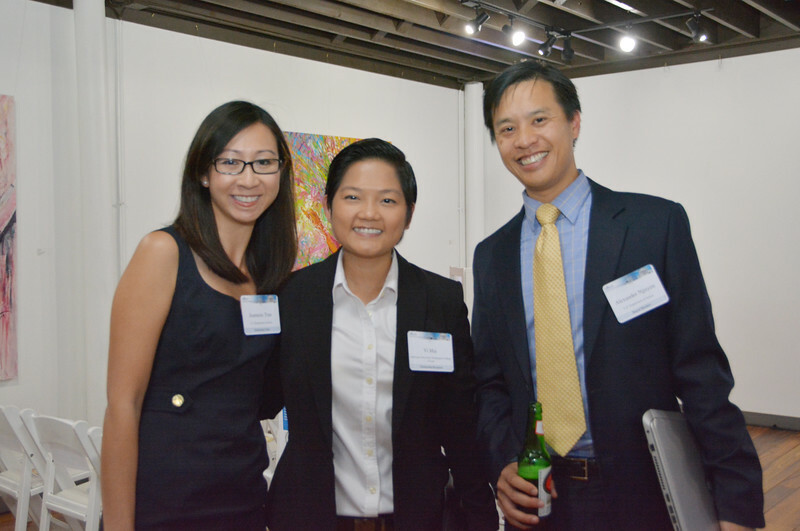 On the evening of September 12, 2018, we celebrated VABA-DC's 9th Annual Scholarship Dinner where we awarded three outstanding law students: Nikki Endsley, Hinh Tran, and Linh Adams. 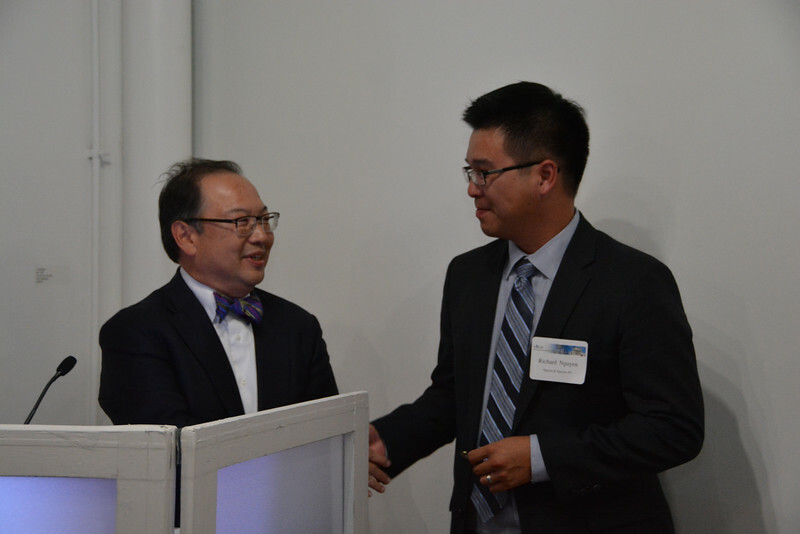 We were also privileged to have Dr. Charles C. Nguyen, Professor and Dean Emeritus of the Catholic University of America as our keynote. A special thank you to our sponsors, donors, speakers and guests for being a large part of our continued tradition of success! Please enjoy our photo album below! 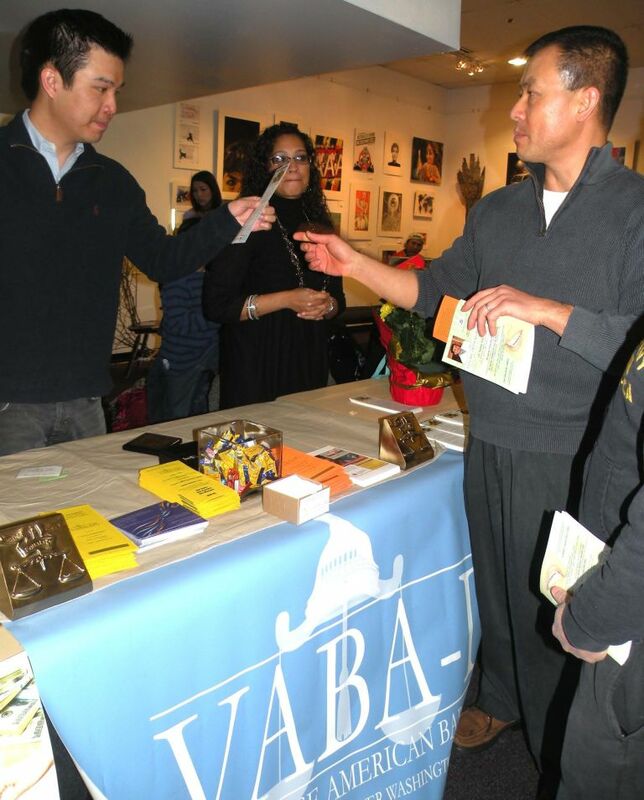 VABA-DC was established, in part, to contribute to the public interest by serving as a voice for the local Vietnamese American community and assisting community members with legal concerns. 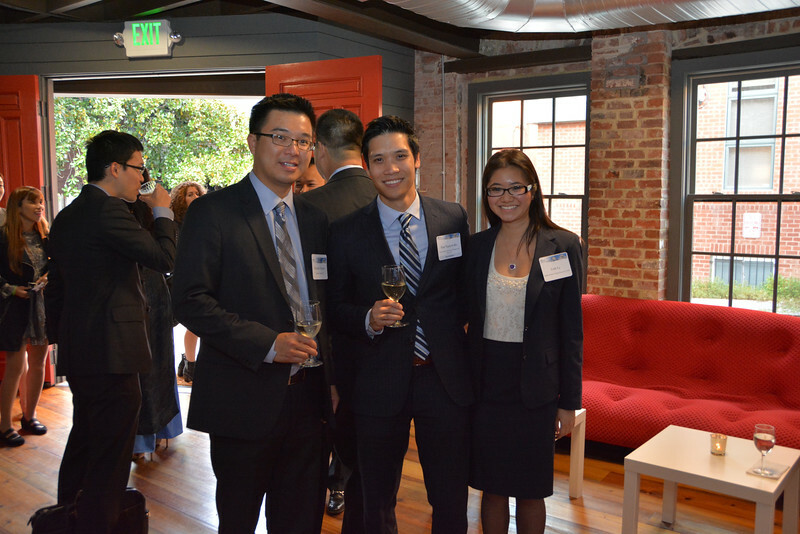 In furtherance of that mission, we are proud to sponsor a $2,500 scholarship for law students who have served or plan to serve the Vietnamese American community or have overcome significant adversity in achieving their academic goals. Scholarship recipients are selected on the basis of community service, academic performance, and their written essay. 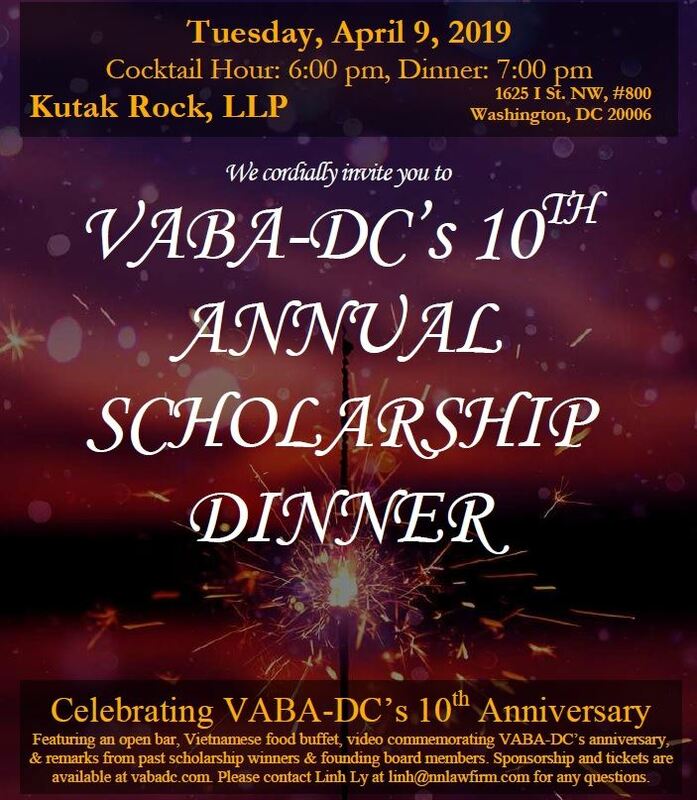 The scholarship recipient(s) will be expected to attend the VABA-DC Scholarship Dinner in their honor to be held on April 9, 2019, at Kutak Rock, LLP, 1625 I St. N.W., Suite 800, Washington, DC 20006. The deadline for applications is February 15, 2019. Please click HERE for the 2019 scholarship application package. Networking Cocktail Hour - 6:00 p.m.
Click HERE to Buy Tickets or Sponsor this Event. By Public Transit: Take the silver, blue or orange line Metro to Foggy Bottom Metro Station and walk .23 miles east to the office. From the North/East: Interstate 95/Baltimore Washington Parkway (Rte. 295)—Follow Baltimore Washington Parkway South. Take the ramp to I-695 towards Capitol Hill. Keep straight onto I-395 S. At Exit 4 take Maine Ave towards downtown. Keep straight onto Independence Ave SW. Bear right onto 17th Street SW. The road name changes to 17th Street NW. Turn left onto Pennsylvania Avenue. Arrive at 2099 Pennsylvania at the intersection of 21st & Pennsylvania Ave., NW. The office will be on the right. From the West: Interstate 66 East/ US-50 E toward Washington, DC—Take left ramp and follow signs for E Street. Take right ramp towards Virginia Avenue. Keep straight onto D Street NW. Take left ramp for E Street NW, towards 23rd Street. Turn right onto 23rd St. NW. At roundabout, take 1st exit onto Pennsylvania Ave. NW. Arrive at 2099 Pennsylvania at the intersection of 21st & Pennsylvania Ave., NW. The office will be on the left. From the South: Interstate 395 North toward Washington, DC— Take the ramp for George Washington Memorial Parkway toward Memorial Bride/Arlington Cemetery. At roundabout, take 1st exit onto Arlington Memorial Bridge. Stay on there until you get to 20th Street. Use the two left lanes to turn onto 20th Street. Turn left onto Pennsylvania Avenue. Arrive at 2099 Pennsylvania at the intersection of 21st & Pennsylvania Ave., NW. The office will be on the right. 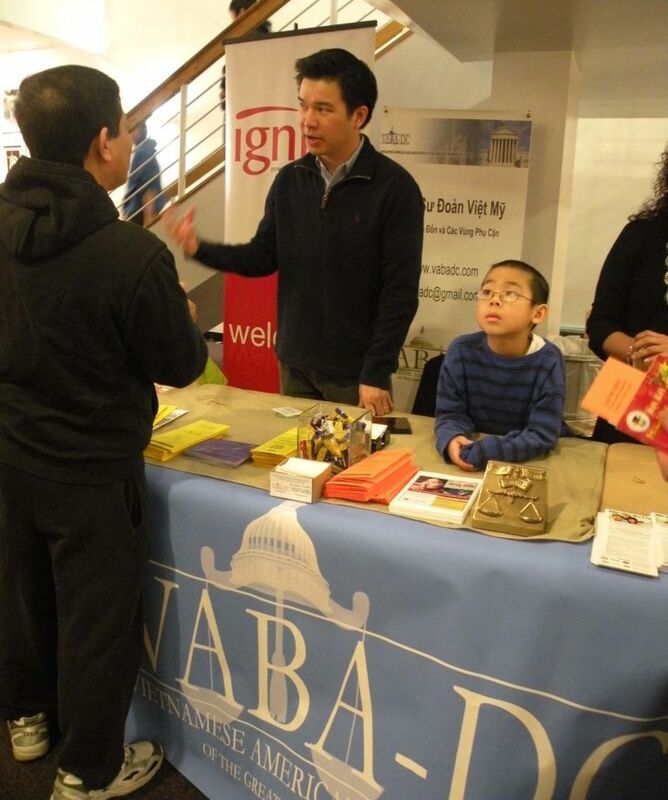 VABA-DC was established, in part, to contribute to the public interest by serving as a voice for the local Vietnamese American community and assisting community members with legal concerns. 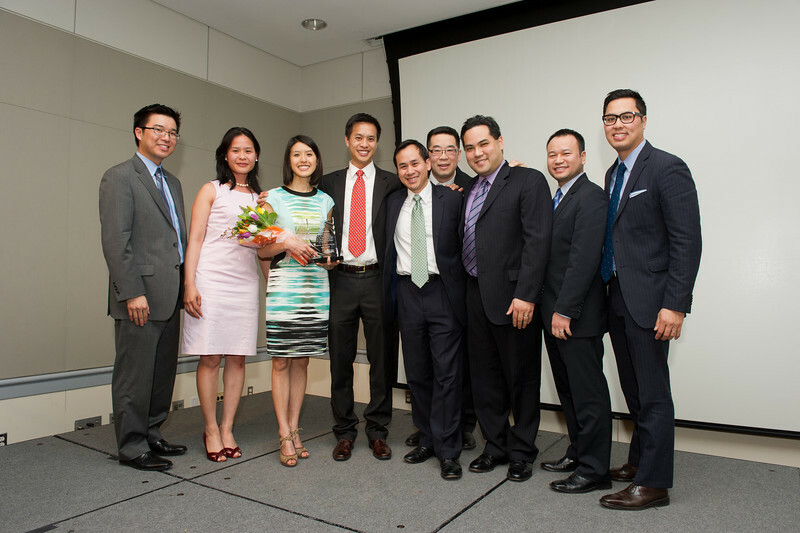 In furtherance of that mission, we are proud to sponsor up to two $2,500 scholarships for law students who have served or plan to serve the Vietnamese American community or have overcome significant adversity in achieving their academic goals. Scholarship recipients are selected on the basis of community service, academic performance, and their written essay. 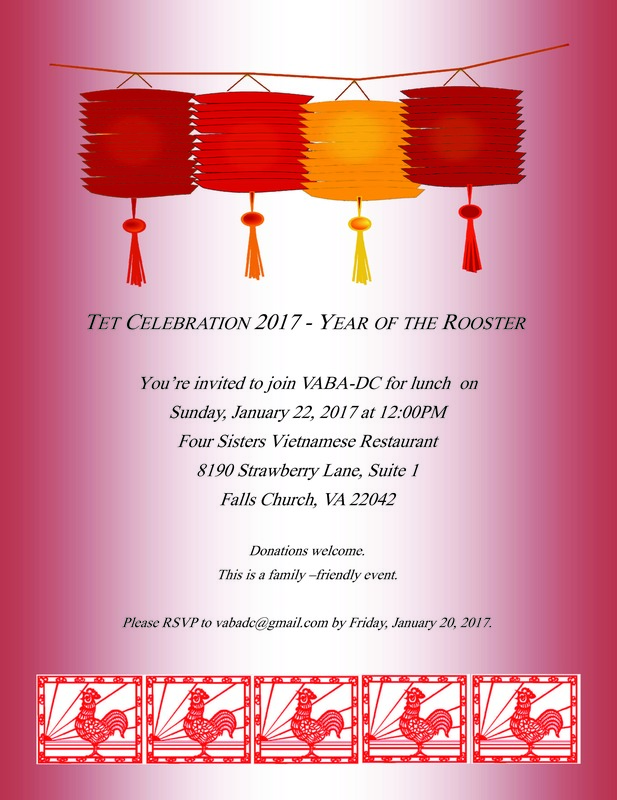 The scholarship recipient(s) will be expected to attend the VABA-DC Scholarship Dinner in their honor to be held later this year. The deadline for applications is March 30, 2018. Please click HERE for the 2018 scholarship application package. 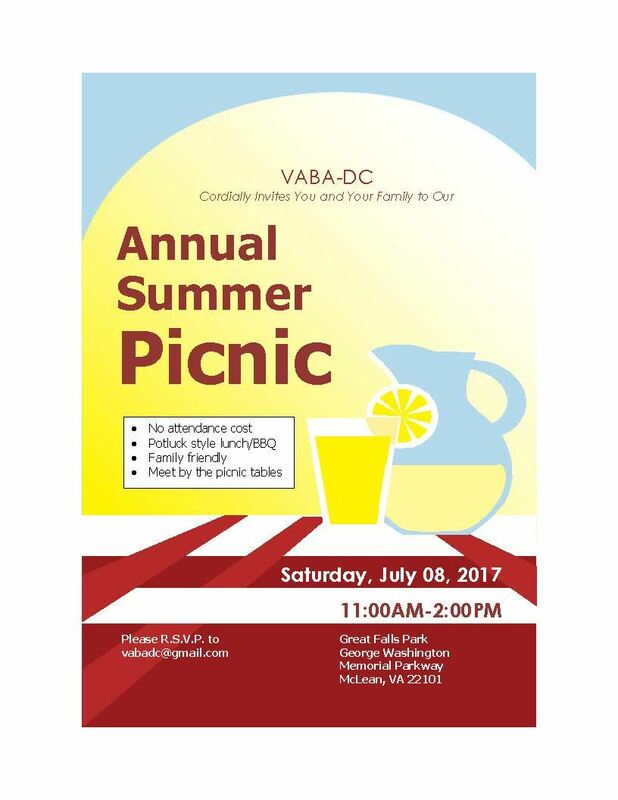 A good time was had by all at VABA-DC's annual summer picnic on July 8, 2017! Scholarship recipients are selected on the basis of community service, academic performance, and their written essay. The scholarship recipient(s) will be expected to attend the VABA-DC Scholarship Dinner in their honor to be held in April 2017. The deadline for applications is March 10, 2017. Please click HERE for the 2017 scholarship application package. If you are new to the legal profession and want to readjust your career path, please join us for a discussion on career transitions! Our speakers have successfully navigated the road to their chosen practice areas and will share their insights. The program will cover 1) how to transition from a non-legal or quasi-legal job to a practicing attorney role; 2) tips on switching practice area tracks from a current attorney role to one that is more in line with a legal practice area closer to interests/passions; and 3) how to transition away from document review projects. Refunds can only be processed for cancellations received more than two business days prior to the event. The WBA regularly hosts programs for the education and enjoyment of its members and guests. The WBA is committed to ensuring that its employees, members and guests are able to conduct their activities free from harassment or intimidation. The WBA, in its sole discretion, therefore reserves the right to deny access or to remove any attendee. Registration or participation in events and other activities constitutes an agreement by the registrant to WBA's use and distribution of the registrant or attendee's image in photographs of such events. 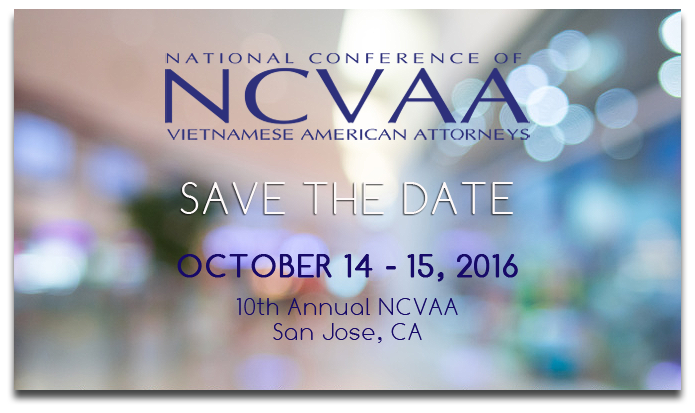 The National Conference of Vietnamese American Attorneys (NCVAA) is pleased to announce that the 10th Annual Conference will be held on October 14-15, 2016 in San Jose, California. 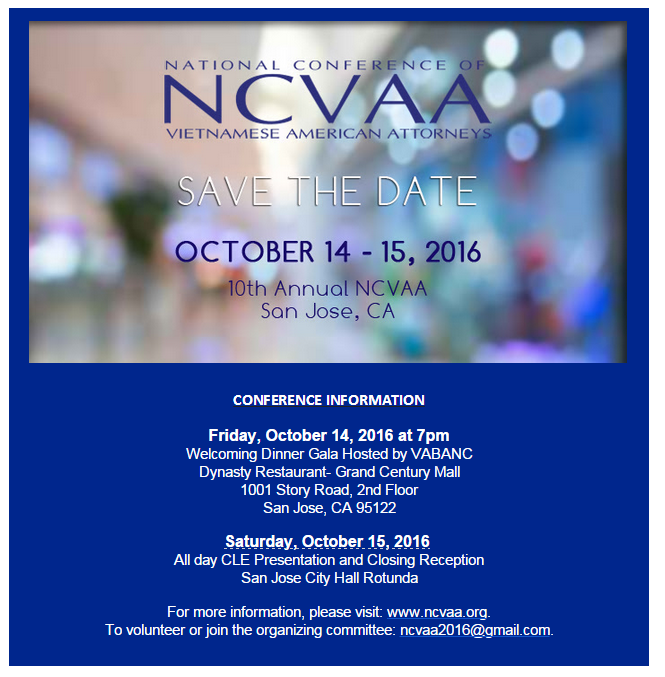 The 2016 conference will take place in conjunction with the Vietnamese American Bar Association of Northern California’s (VABANC) 18th Annual Scholarship Dinner on Friday, October 14, 2016. VABANC is honored to co-host the combined event this year as NCVAA returns to San Jose, where VABANC co-hosted the very first conference in 2006. This year’s conference, based on the theme “Innovate”, provides an opportunity for attendees to network with attorneys, members of the judiciary, prominent legal scholars, jurists, and law students from all over the nation. Attorneys can receive valuable continuing legal education (CLE) credits on a number of stimulating current topics taught by scholars and practitioners. Register today to take advantage of early bird prices. After September 9, 2016, registration prices will increase. To register, please click here. 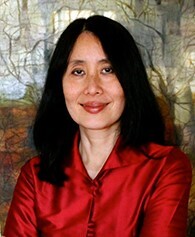 On the evening of April 27, 2016, we gathered at the Willard Event Center in Washington D.C. to hear Lan Cao, professor and author of Monkey Bridge and The Lotus and The Storm, deliver an inspirational keynote speech. 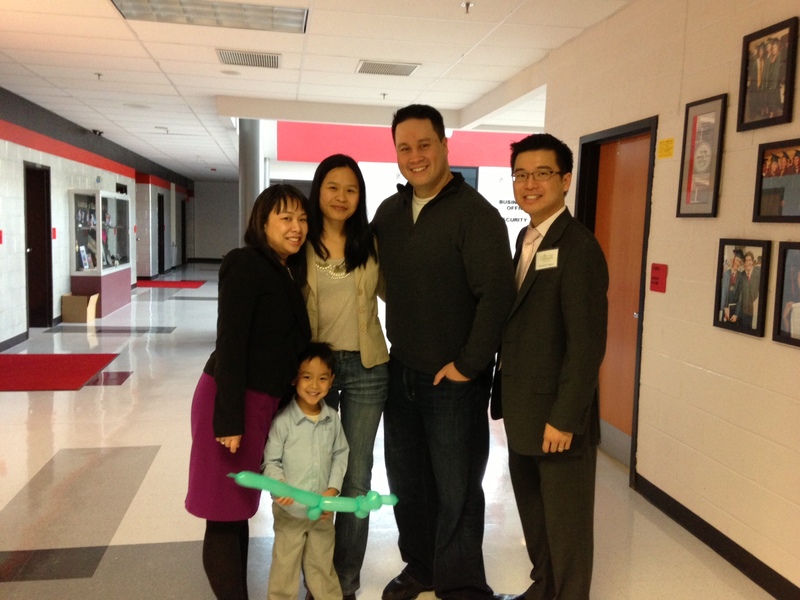 We also had the pleasure of awarding scholarships to Thuc-Doan Phan (George Mason University School of Law, J.D. Candidate 2017) and Emma Nguyen (The George Washington University School of Law, J.D. Candidate 2018). 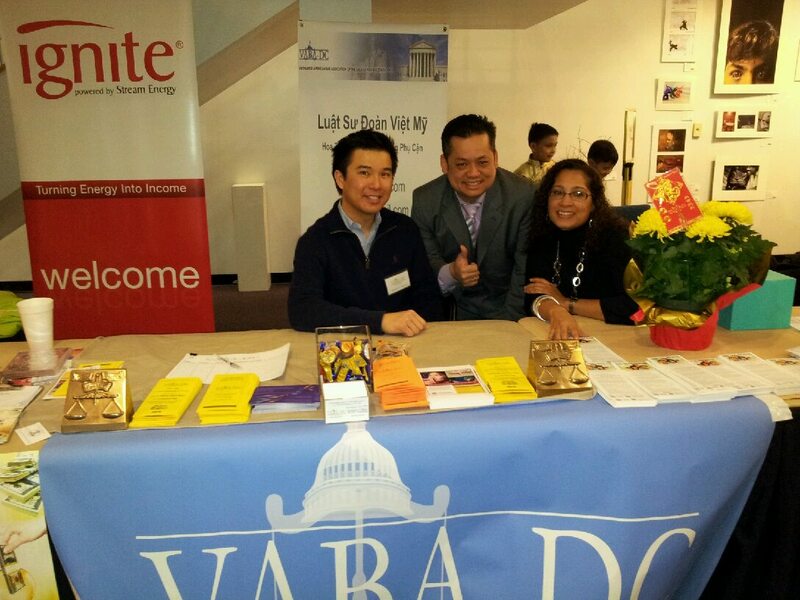 VABA-DC was established, in part, to contribute to the public interest by serving as a voice for the local Vietnamese American community and assisting community members with legal concerns. 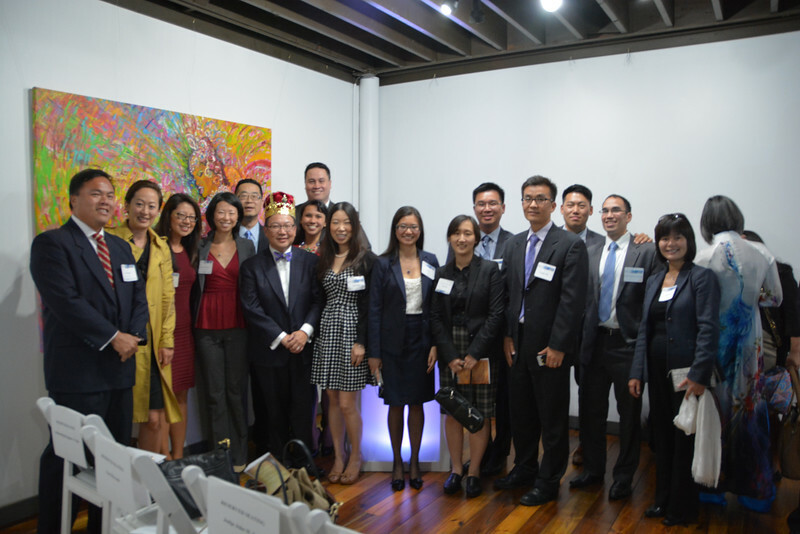 In furtherance of that mission, we are proud to sponsor up to two $1,500 scholarships for law students who have served or plan to serve the Vietnamese American community or have overcome significant adversity in achieving their academic goals. Scholarship recipients are selected on the basis of community service, academic performance, and their written essay. The scholarship recipient(s) will be expected to attend a VABA-DC Scholarship Dinner in their honor to be held in March 2016. The deadline for applications has been extended to March 28, 2016. Please click HERE for the 2016 scholarship application package. 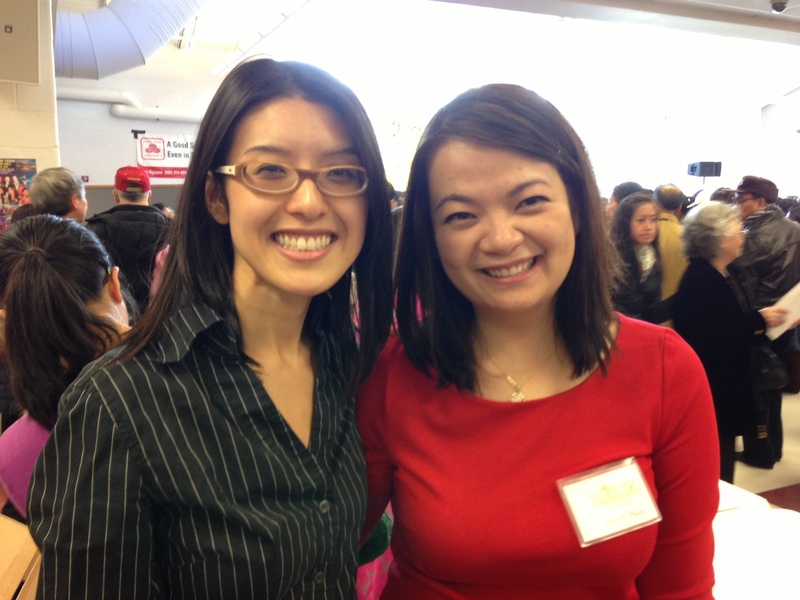 Come join APABA-DC's Annual Lunar New Year Celebration and celebrate with other local Asian bar associations! 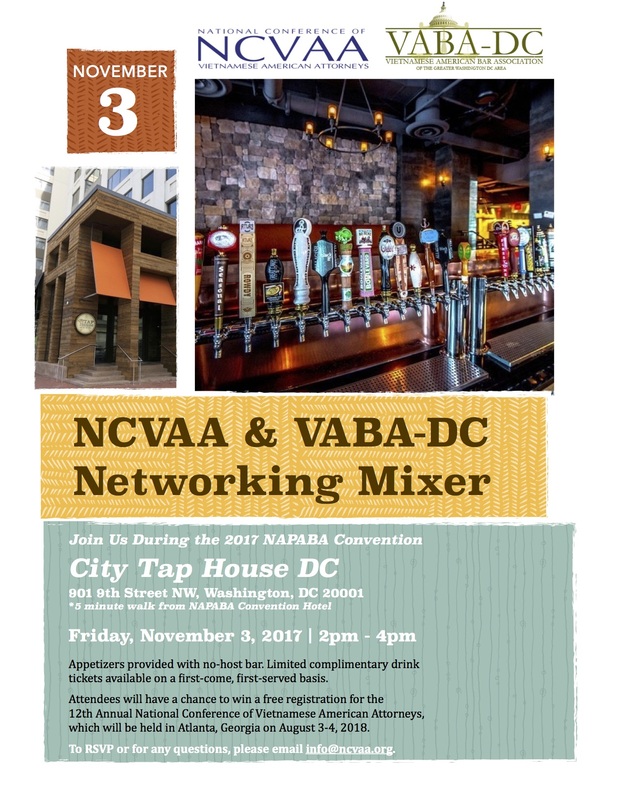 APABA-MD, APABA-VA, KABA, and VABA-DC are confirmed co-sponsors. This event will be held at Capitale (1301 K St., NW, Washington DC) on Thursday, February 25, 2016. Doors open at 6 pm, and the party will go from6:30 to 9 pm. Food will be provided and will be vegetarian-friendly. There will be a cash bar for drinks. Event is free to members of APABA-DC and the co-sponsors and is $10 for non-members. For questions about the event or if your organization is interested in co-sponsoring it, please contact Scott Lee and Neville Jiang at programs@apaba-dc.org. 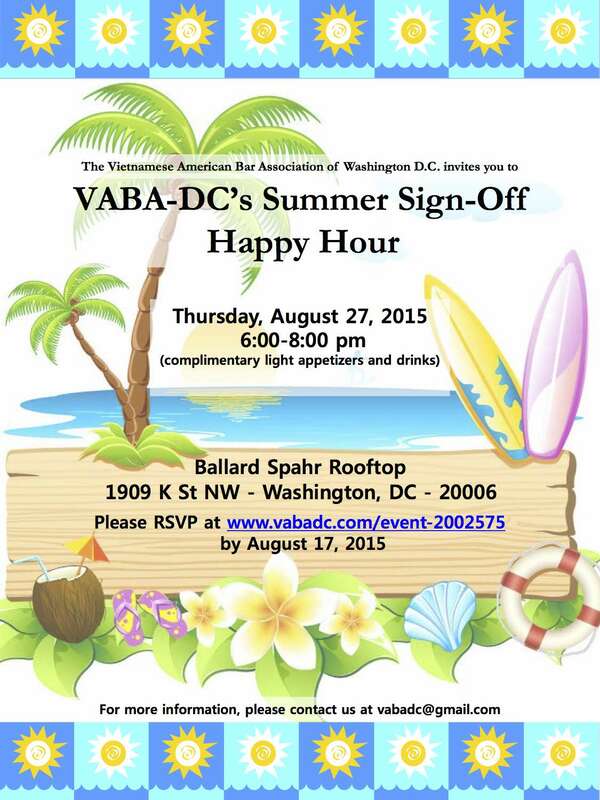 VABA-DC invites all Vietnamese women attorneys and law students to our Third Annual Women's Happy Hour. Please join us for an evening of informal networking and casual conversation. 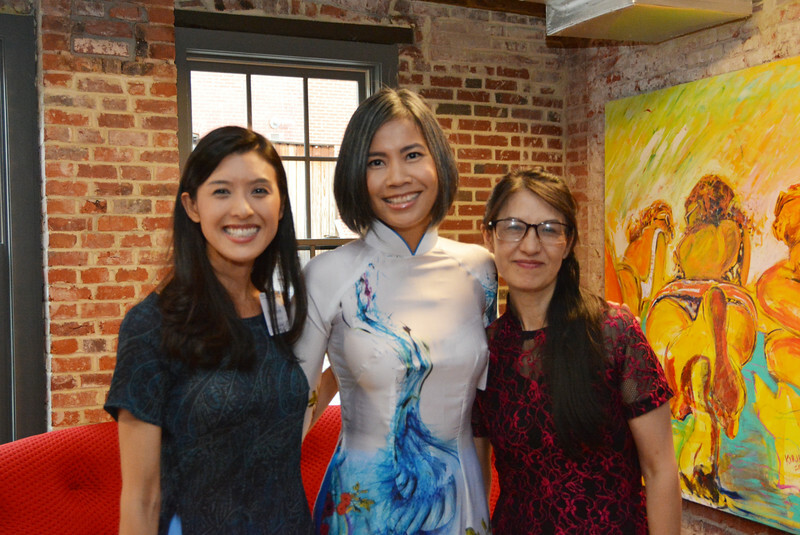 VABA-DC hopes to establish a foundation of support to address the unique aspects of being a woman of Vietnamese heritage in the D.C. legal field. Food and drinks are on us! Date and Time: Thursday, October 8, 2015; 5:30 to 7 p.m.
RSVP to vi.nt.mai@gmail.com by Friday, October 2nd. 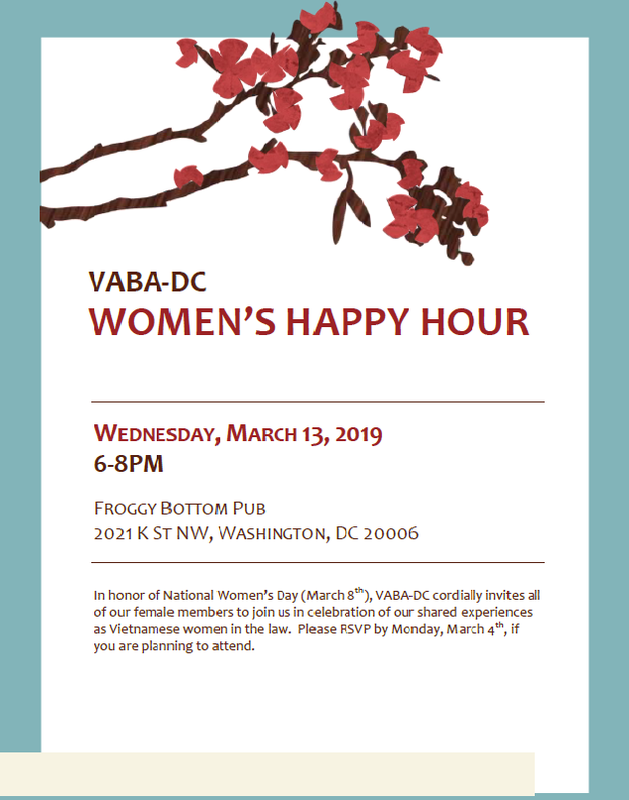 Please include "VABA-DC Third Annual Women's Happy Hour" in the email subject line. 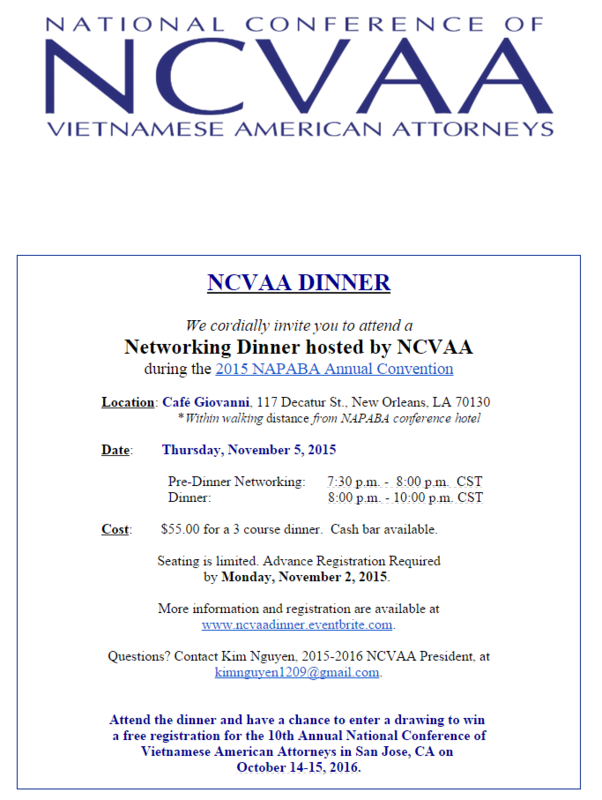 Are you interested in attending the 9th Annual National Conference of Vietnamese American Attorneys (NCVAA) in Boston on September 18-19, 2015? If so, VABA-DC is offering to sponsor up to two VABA-DC attorneys and/or student members to represent VABA-DC at the conference. Each of the sponsorships will cover conference registration fees. If you are interested in applying, please send a brief (300 words or less) statement of interest to vabadc@gmail.com on or before Monday, August 17, 2015. 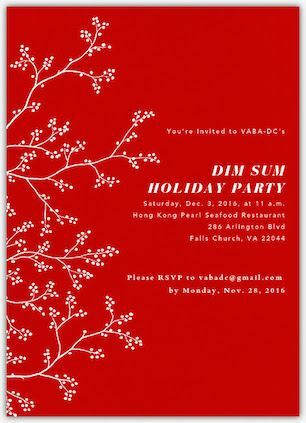 The VABA-DC Board will give special consideration to your past involvement in the DC area Vietnamese community and financial need in making this decision. 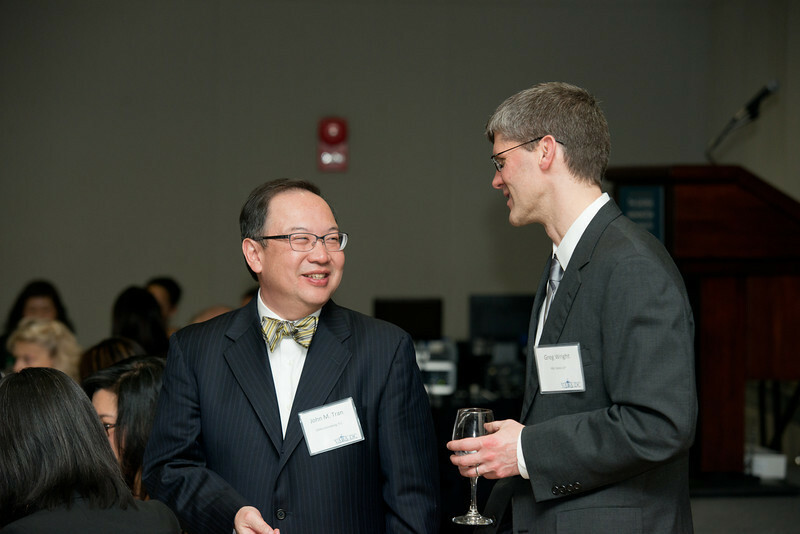 On the evening of May 18, 2015, we gathered at the Willard Event Center in Washington D.C. to hear the Honorable Tu M. Pham deliver an inspirational keynote speech. 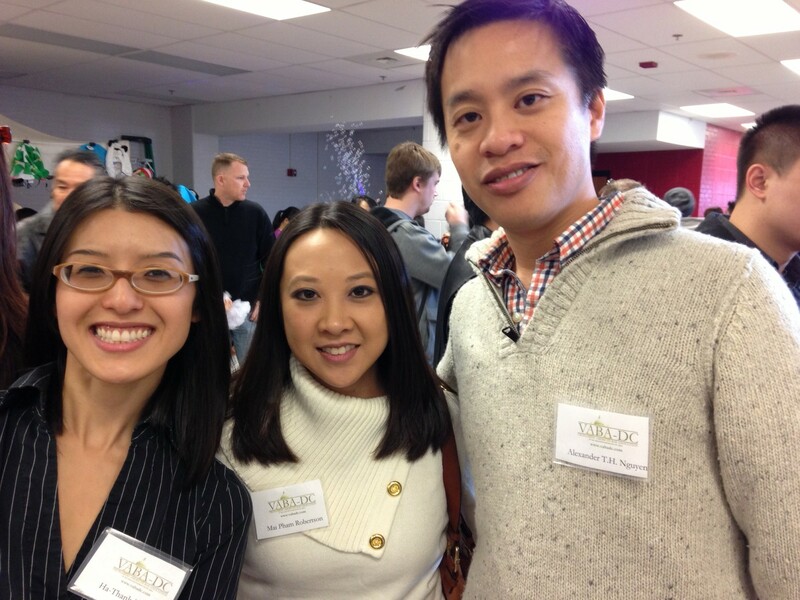 We also had the pleasure of awarding scholarships to Anh Vu (UDC David A. Clarke School of Law, J.D. Candidate 2016) and Natalie Phan (University of Georgia School of Law, J.D. Candidate 2017). Monday, May 18, 2015 at 6:00 p.m. Please RSVP to Linh Ly at lly@susanhicksgroup.com by April 20th and indicate what food you will be bringing. Get excited for the warm weather! Scholarship recipients are selected on the basis of community service, academic performance, and their written essay. The scholarship recipient(s) will be expected to attend a VABA-DC Scholarship Dinner in their honor to be held in May 2015. 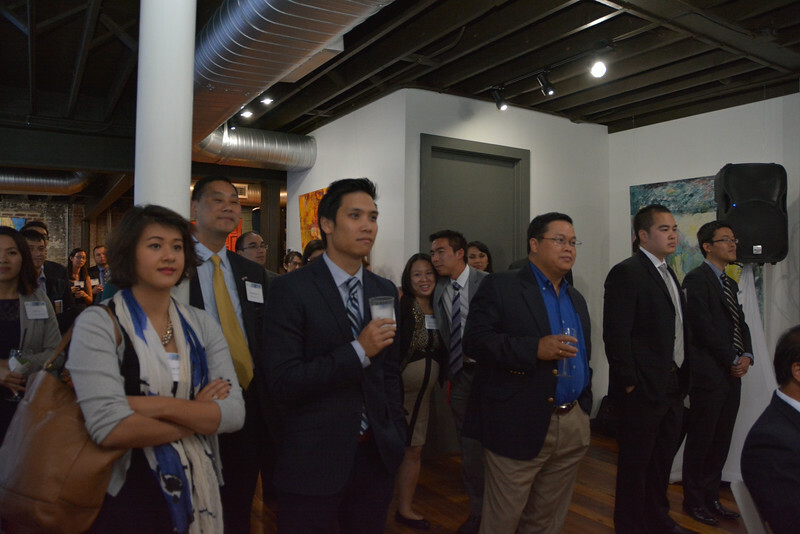 On the evening of September 23, 2014, we gathered at Toolbox in DC to hear the honorable John M. Tran deliver an inspirational keynote speech. 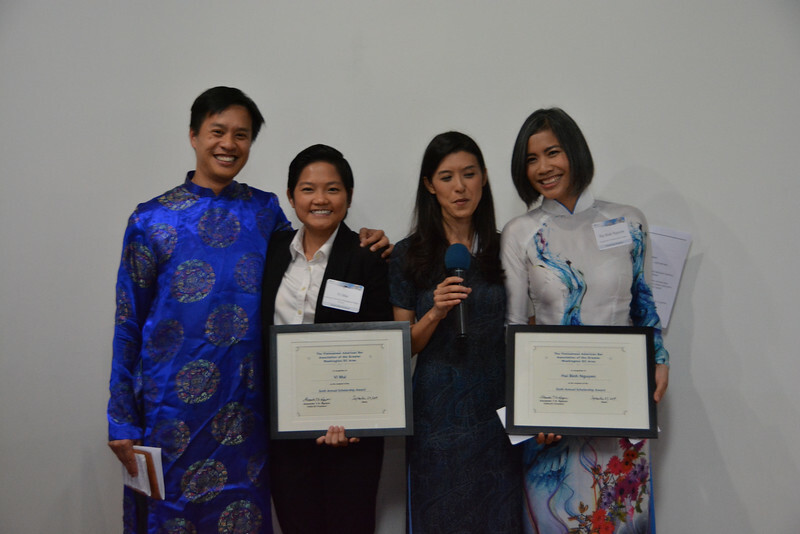 We also had the pleasure of awarding scholarships to Vi Mai (American University Washington College of Law, J.D. Candidate) and Hai Binh Nguyen (Georgetown University Law School, J.D. Candidate). Sponsorship opportunities are now available! Click here to sponsor this event. 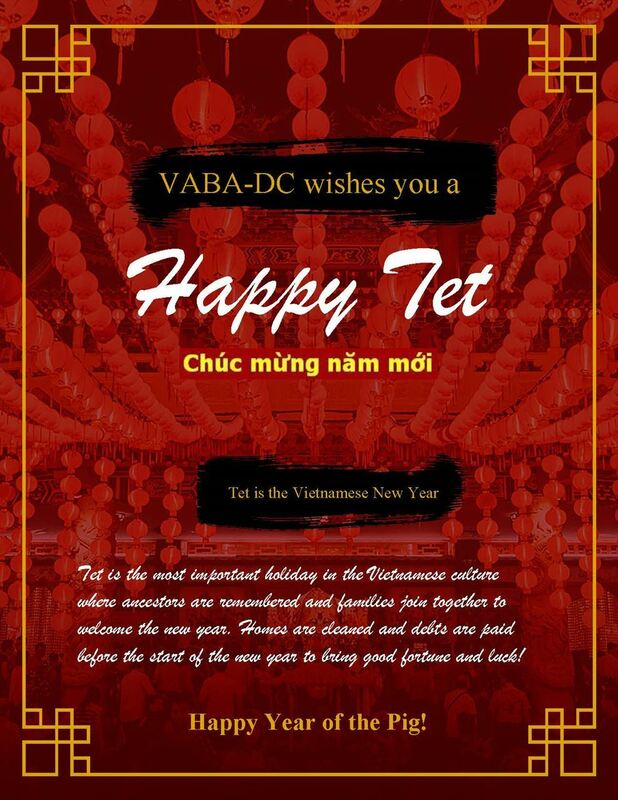 VABA-DC would like to congratulate the Association of Vietnamese Americans (AVA) for its success in organizing and hosting the 2014 Lunar New Year “Tet” Festival in Silver Spring, Maryland. We thank everyone who visited our table for their interest in our mission and for their continued support. VABA-DC looks forward to participating and engaging the community at this event for years to come. Chúc mừng năm mới! 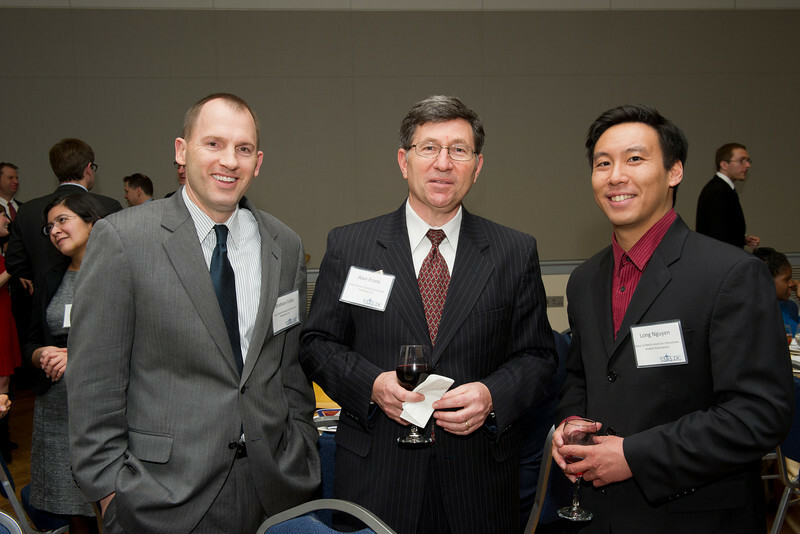 Thank you for making the 2013 Fifth Annual VABA-DC Scholarship Dinner a huge success! 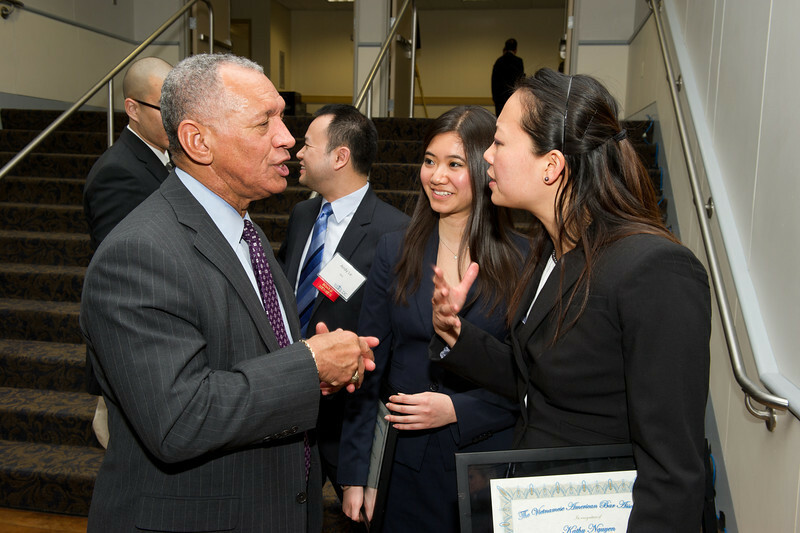 On the evening of March 19, we had over 150 people gathered at GWU to hear NASA Administrator Charles F. Bolden deliver a remarkable keynote speech. We were joined by NASA General Counsel Michael Wholley and enjoyed a video greeting by the first Vietnamese American NASA Astronaut Eugene H. Trinh. 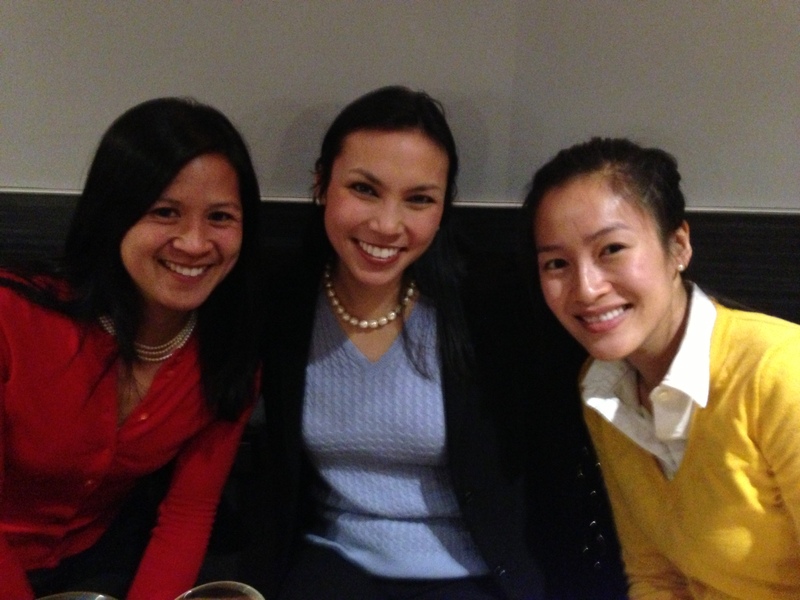 We awarded scholarships to Kathy Nguyen (University of Pennsylvania Law School, J.D. 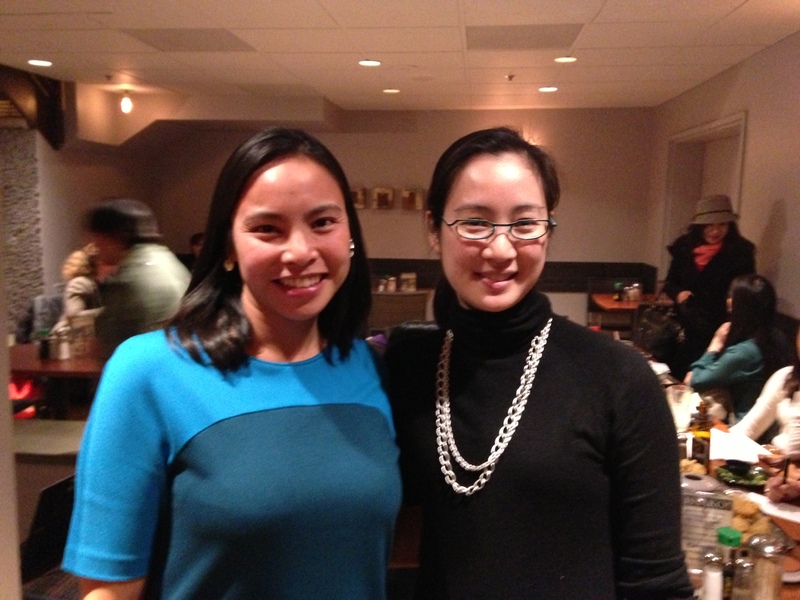 Candidate) and Linh Ly (University of Baltimore Law School, J.D. Candidate) and celebrated the accomplishments of our Vietnamese American legal community with art flown in from Vietnam by Galerie Brigitte and traditional Vietnamese instrumentals by Nhung Vu. Our Vietnamese culinary experience was made possible by Present Restaurant’s Chef Luong Tran who prepared our meal onsite with his entire culinary team. 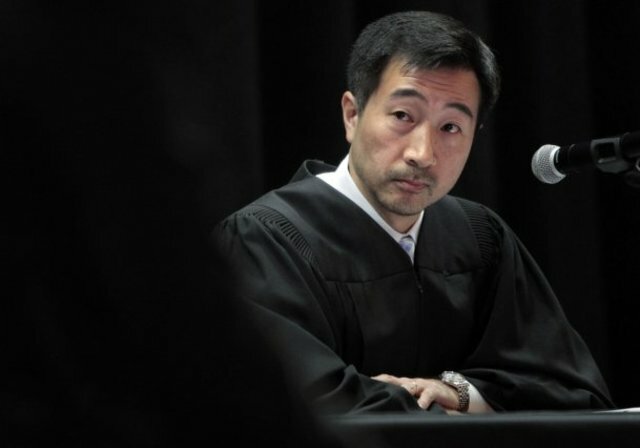 The story that most Vietnamese American lawyers will tell you is that they did not know any lawyers while they were growing up and that the idea of going to law school did not even cross their minds until later in life. But, many of these lawyers will also tell you that pursuing the law turned out to be absolutely the right thing for them. Reflecting on this reality, one of VABA-DC’s former scholarship recipients insightfully observed: "We should start with the high school students at the time they are thinking about college and career directions and in need of information, guidance and inspiration. I didn't discover my interest in and passion for the law until several years after college graduation - a bit of soul searching and wandering on my part. I think that any efforts to reach out to and introduce what it means to be a lawyer in America to our young students would yield long-lasting, career shaping impact." VABA-DC agrees and is starting a series of informal conversations with college students to teach them about the law track, possible careers with a law degree, and the doors it can open. 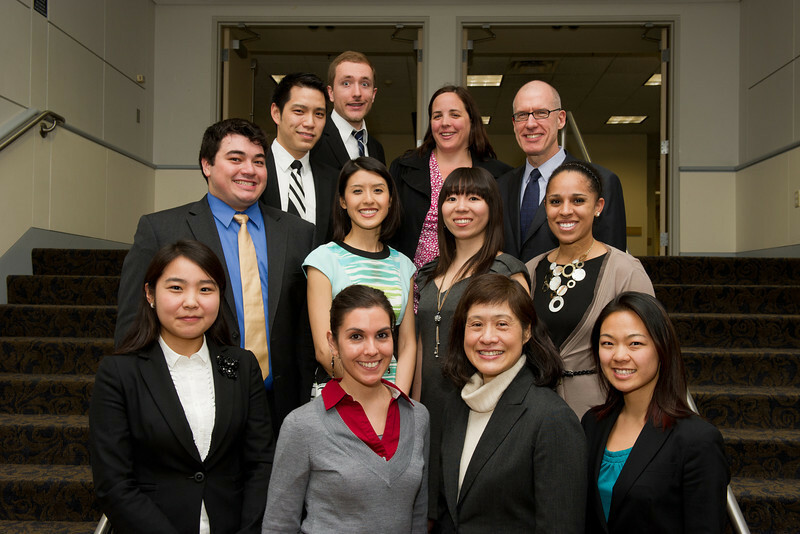 On Monday, March 18, 2013, when Hansel Pham and Caroline Nguyen, two of VABA-DC’s board members, met with a group of Vietnamese American students at Georgetown to discuss their careers and answer students’ questions. The event was organized by the Georgetown University Vietnamese Students Association (GUVSA), and seven students were in attendance. None of the students were currently pre-law, but everyone asked truly insightful questions about the legal practice, including the truly interdisciplinary nature of the law, the reasons why an engineer or business major might want to become a lawyer, justifications for representing unsympathetic clients, the nature of practicing law in a big law firm, and the reality about the current legal job market. 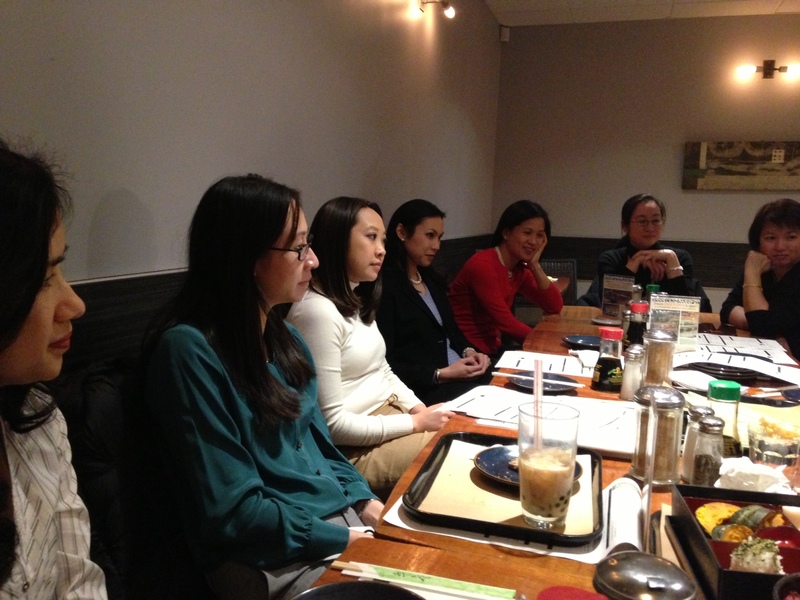 On February 21st, VABA-DC hosted a women's mentoring event at Teasim bringing together a group of Vietnamese American female attorneys with diverse legal backgrounds, including government lawyers, in-house counsel, law firm associates, non-profit attorneys, and DC area law students. "From VABA-DC founding board members to attorneys new to the DC area, everyone was excited to get together with old and new friends who support each other in their continued career growth. There's a strong need for this type of mentorship and its great that VABA-DC is investing in it!" 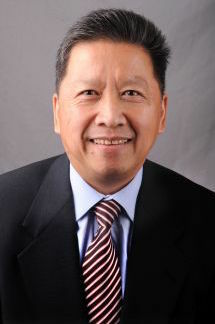 said Board Member Thanh Nguyen. 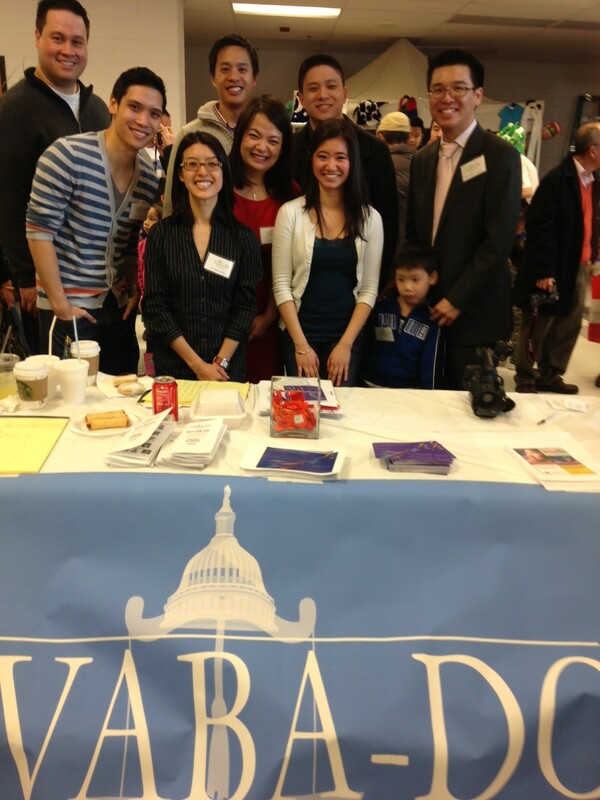 VABA-DC’s participation in the February 3, 2013 Tet Festival at Langley High School in McLean, Virginia, hosted by the Vietnamese Senior Citizens Association, was aimed at learning about and addressing the legal needs of the elderly population in the Vietnamese community. 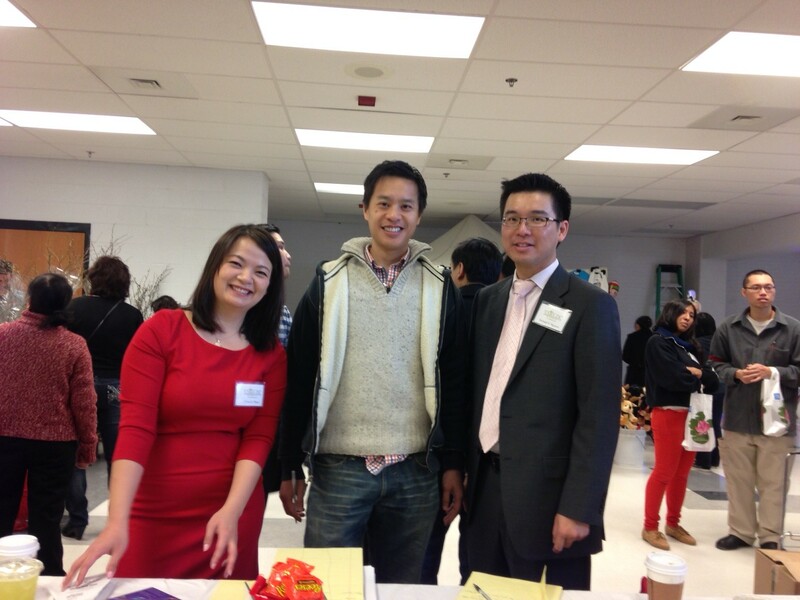 Our members distributed Vietnamese language materials on wills as well as information about citizenship eligibility. VABA-DC is encouraged by the interest expressed by many in trust and estate planning which evidences a strong desire to provide for the well-being of younger generations. Many community organizers and leaders also expressed an interest in legal support for non-profits and greater collaboration between the many groups in our community. VABA-DC will take the knowledge gained from this event and incorporate it into its upcoming projects which will hopefully connect legal service providers with those in the community in need of their services. 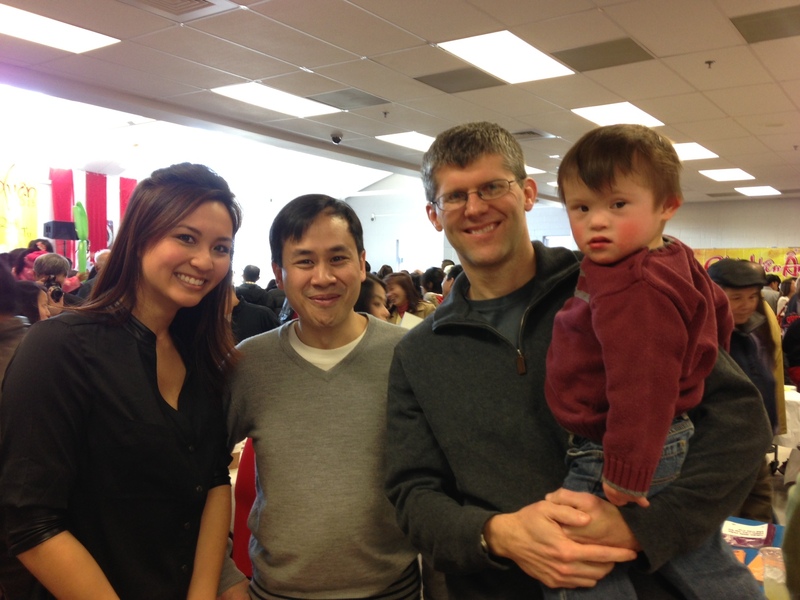 VABA-DC would like to thank all of its members who proudly represented the diversity of Vietnamese-American attorneys at the 2013 Lunar New Year “Tet” Festival hosted by the Association of Vietnamese Americans in Silver Spring, Maryland on January 27, 2013. Thirteen members interacted with guests at the VABA-DC table throughout the day and engaged community members and leaders in discussions about the legal needs of the community including the pressing need for greater access to competent legal representation across all sectors. Several community leaders provided insight as to how the community could benefit from additional legal support in the area of non-profit organization. A number of individuals requested assistance in finding referrals to Vietnamese speaking attorneys to help with issues ranging from family law to trusts and estates. 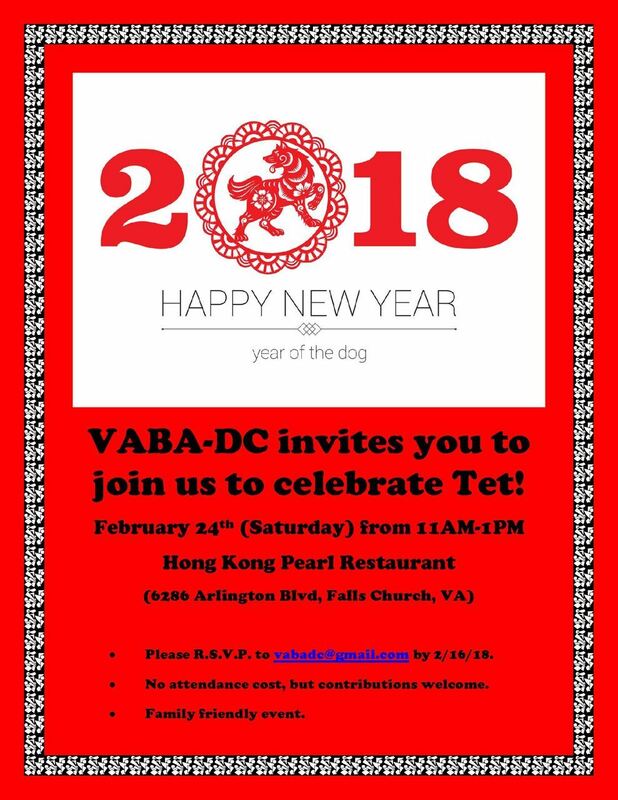 VABA-DC is encouraged by the support of both its members and the community and is energized by the positive response we received at this event. As a result, VABA-DC is seeking to directly address the issues expressed by the community and is establishing a lawyer referral service to aid Vietnamese speakers in finding competent counsel who may be able to meet their language needs. 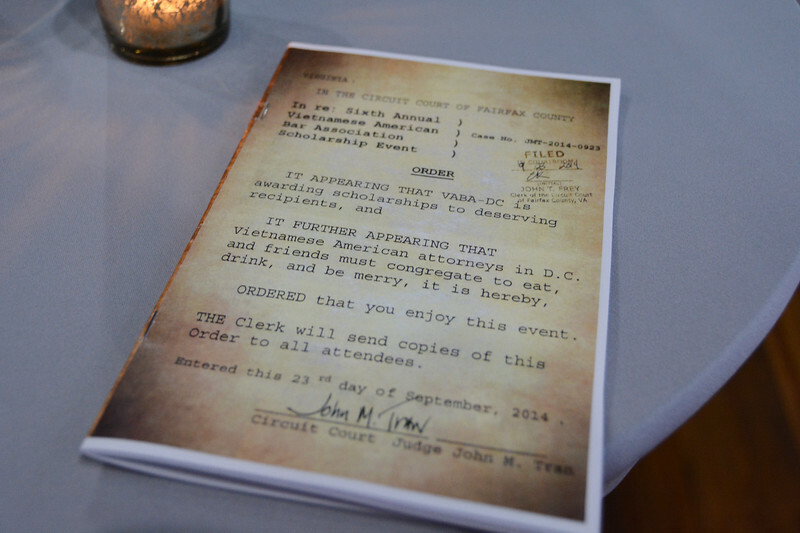 In addition, VABA-DC is exploring ways in which to partner with other non-profits and community organizations to assist in sustaining our collective efforts by supporting their legal needs. 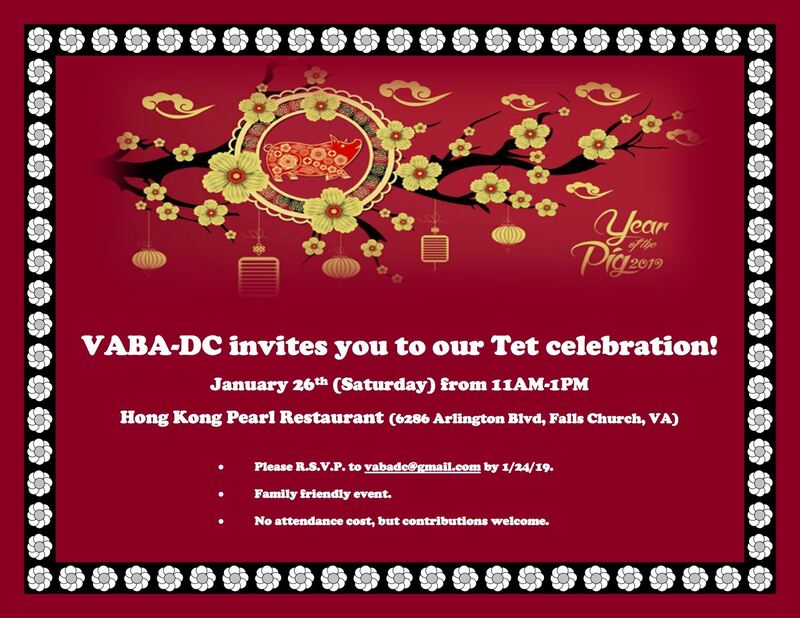 Based on the positive feedback from this event, VABA-DC will be participating in the upcoming Tet Festival on Sunday, February 3, 2013 at Langley High School in McLean, Virginia hosted by the Vietnamese Senior Citizens’ Association and will be continuing the dialog with the community and its leaders. We hope to see you there. 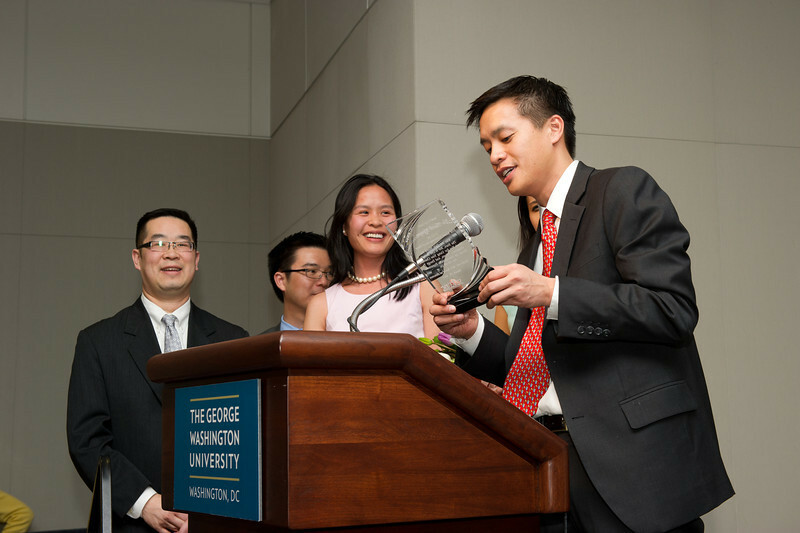 PRESS RELEASE: VIETNAMESE AMERICAN LEGAL CONFERENCE IN WASHINGTON D.C. Already a member? Login above to update your profile, pay your dues, and access members-only areas. If this is your first time logging on, choose Forgot Password and your password will be mailed to you. 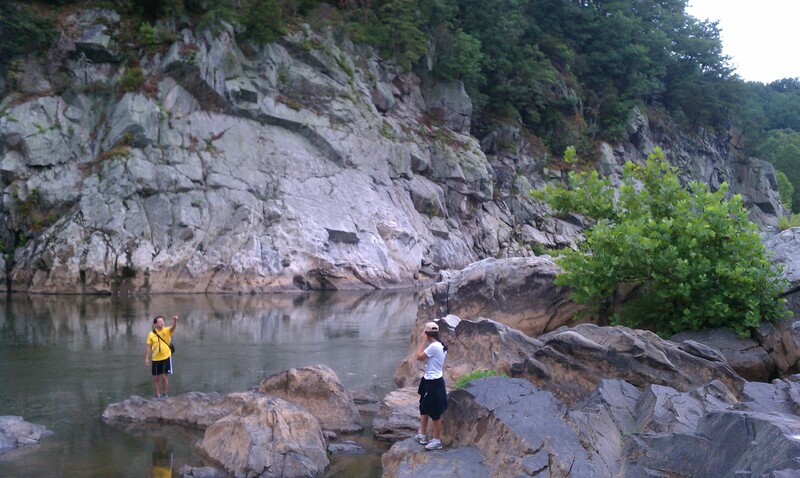 © VABA-DC 2012. All rights reserved.